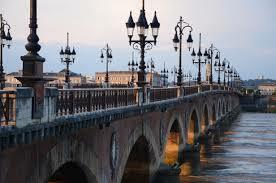 Bordeaux is one of the largest cities in France, located in the Southwest of France on the Garonne river. It is mainly known for its quality wines and represents the world’s major wine industry capital. Also, the old town and the historic district of the city is on the UNESCO World Heritage List, thanks to its well preserved historical monuments and the 18th century style. 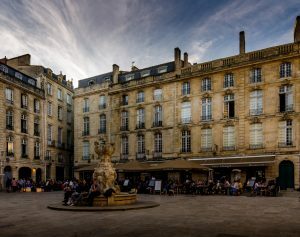 In Bordeaux you can find one of the largest squares of all Europe, Place des Quinconces, located at the very center of the town: columns and marble statues are allegories of triumph, navigation and commerce, recalling the majesty of old times. 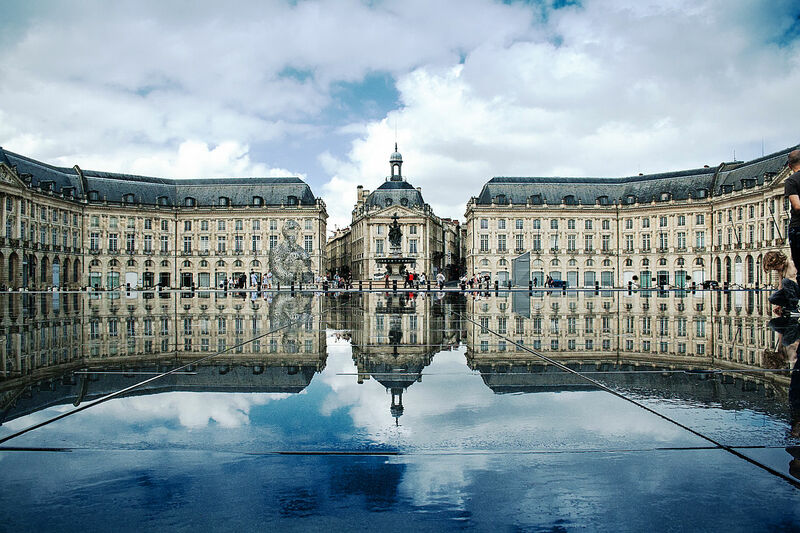 Close to this square, you will find Place de la Bourse, a very particular square which hosts the famous Water Mirror, the world’s largest reflecting pool which, especially in summer, creates amazing water shows. One of the main sights in town is, without a doubt, the romantic Pont de Pierre, a bridge with seventeen arches which links the two sides of the Garonne river: there, you can have a relaxing walk with your partner and enjoy the beautiful river, maybe when the sun slowly fades away. There are several districts in Bordeaux: Saint-Michel, the cosmopolitan district, with restaurants and markets from all over the world; the elegant and luxurious Les Grands Hommes. However, the most typical district is certainly Saint Pierre, the old town: situated close to the port, it has unique monuments and sights with amazing architectural styles. There, you can find Place du Parlement, Porte Cailhau, with its unique old silhouette, along with the aforementioned Pont de Pierre and Water Mirror. On the left bank quays of the river, you can enjoy one of the most magnificent waterfronts in the world, while passing close to many historic buildings: you can relax in one of the parks or do some shopping, it’s up to you! 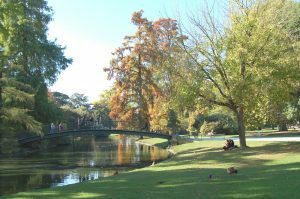 On the other side of the Garonne, don’t miss the Jardin Botanique de la Bastide, a botanical garden with an arboretum, fields of grain, vines, dunes and cliffs. 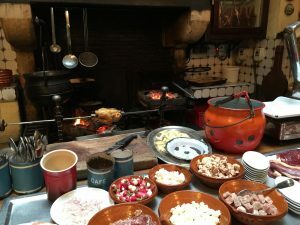 Close to St. Pierre, you can visit the charming Chartrons district: centred around the Church of St. Louis, it has a unique village-like atmosphere, with small bars, restaurants and bistros where you can relax. There, you can the CAPC, that is, the Museum of Contemporary Art, a former warehouse for colonial goods which today houses avant-garde, visual and performance art exhibitions, trying to include different themes and different styles. The Chartrons district, historic heart of the wine trade, is the perfect place to drink some glasses of wine and literally ‘taste’ the reason why Bordeaux is worldwide known for its wine industry. You can taste wine everywhere in the city, but probably you can get the best experience at the CUV (Cave Utile en Ville) an independent wine retailer, at the CIVB or at the City of Wine. 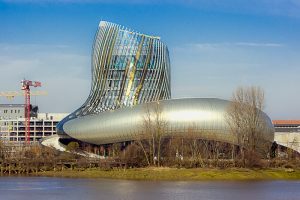 Indeed, close to Chartrons, you will find the Cité du Vin – which means, th City of Wine – an impressive cultural centre dedicated to the living heritage of wine. Within the building, you can join a particular journey, in order to see the different ages and civilisations linked to the wine industry. The unique architecture of this 10-level building will turn the visit into a breathtaking experience, which may end with a panoramic view over the city from the restaurant LE7, on the top of the building. 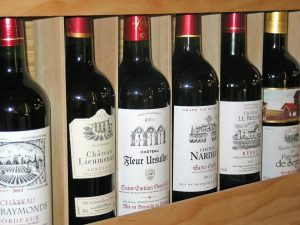 Also, you can visit the Museum of Wine and Trade, where you can learn the classifications of wine, the history and the trade system, or the huge Museum of Fine Arts, with masterpieces by Tiziano, Rubens, Van Dyck, Delacroix, Renoir, Matisse and Picasso. 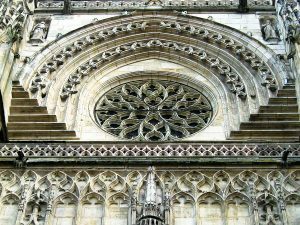 If you are interested in religious monuments, you cannot miss the Saint André Cathedral, seat of the Archbishop, with its Roman architecture and house of the Marcadé collection (paintings, sculptures and liturgical objects). Next to the cathedral you will find the impressive Pey Berland Tower and its gothic style; not far from there, you can finally reach the Basilica of Saint Michel, a gothic church with the amazing representation of Saint Michael slaying the dragon. You should definitely try local products! 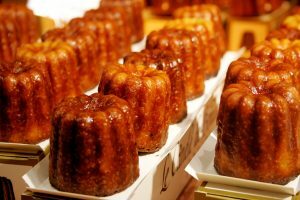 A glass of Lillet to start your meal, oysters from Arcachon Bay, a spicy sausage called grenier médocain, some ‘pibales’, that is, the so-called ‘caviar of Aquitaine’, along with delicious golden cannelés, traditional pastries flavoured with rum and vanilla. And remember, when you want some ‘pain au chocolat’, you have to ask for a ‘chocolatine’! Last but not least, on Sundays, you will find amazing and crowded markets, such as the Capuchins Market and the flea market at the Quai de Salinières!